Toronto (November 11, 2011) – Canada’s top coaches and sport administrators were honoured at the Petro-Canada Sport Leadership Awards Gala, hosted by the Coaching Association of Canada (CAC), on Friday night at The Fairmont Royal York hotel in downtown Toronto. There were 44 winners of this award for the 2010-2011 season. These prestigious awards recognize coaches whose athletes have excelled at World Championships, Olympic and Paralympic Games and the Special Olympics World Games. Kathleen Millar (Winchester, ON) received this award in recognition of Christopher Perkins’ gold medal performance at the senior world archery championships in Torino, IT in 2011. Kathy was escorted by Christopher’s father, Spencer, in gratitude for his continuing support of her coaching. “Petro-Canada has supported the recognition of Canada’s coaches for 11 years and has recognized over 200 of Canada’s best. This year, as in years past, there is an incredible list of talented coaches that we are very proud to celebrate,” said Steven Keith, Director, Loyalty and Marketing Partnerships, Petro-Canada, a Suncor Energy business. Attention all South Nation Archery Supply customers and residents of eastern Ontario and western Quebec, SNAS Vice-President Larry EUGENE Smith of Winchester, ON is NOT the same person as Larry SIMON Smith of Williamsburg, ON who has been charged with bowhunting violations in the state of Illinois. Ottawa, ON . . . The Canadian Association for the Advancement of Women and Sport and Physical Activity (CAAWS) is pleased to announce the five recipients of the 2011 Stacey Levitt Women and Sport Scholarship. These young women, from various regions of Canada, all share a passion for sport, serve as role models in their communities, and believe in empowering others to lead a healthy and active lifestyle. The Stacey Levitt Women and Sport Scholarship was established in honour and memory of the life of Stacey Levitt, a superior athlete and top student who was struck and killed by a car while jogging on August 30th, 1995. Stacey participated in sport for the sheer joy of the experience, its camaraderie, its teamwork and its competition. This is the 15th year that the $2,500 scholarship has been awarded by her family to a young woman, a girls’ team or sport organization that exemplify Stacey’s ideals and qualities. Each recipient will receive $500 and a copy of the book I Am a Rose, which is a compilation of poetry written by Stacey Levitt. Congratulations to the 2011 Stacey Levitt Women and Sport Scholarship Recipients! Sixteen year old Jordan Sequillion is an honour student at Kingston Collegiate and Vocation Institute High School (KCVI), a member of the KCVI athletics association, a natural athlete, and a promising archer competing at both the national and international levels. Jordan was recently the youngest female recurve archer to compete for Team Ontario at the Canada Winter Games; she won a silver medal. Other achievements include winning a gold medal and team silver at the Canadian Indoor Championships, capturing a silver medal at the US National Indoor Field Championships, anchoring the gold medal for the Canadian Senior Team, and setting a new national record in the North and South America indoor event. Jordan’s passion for archery led her to become a NCCP Beginner Level Coach, enabling her to share her love of the sport and encourage others to try it. In addition to training several young families, Jordan is actively leading the creation of her high school’s first archery club to encourage further participation in the sport. Jordan also shares her experiences and offers guidance to young archers through a personal website and blog dedicated to archery. Jordan trains six days a week in pursuit of her Olympic dreams. Upon completion of high school, she plans to pursue a degree in kinesiology and physiotherapy, as well as become a national level archery coach to train the next generation of Canadian archers. Jordan’s strong work ethic, passion and love for the sport continues to motivate her today. She hopes that she can continue to inspire and encourage young athletes to achieve their dreams through their participation in sport. The Canadian Association for the Advancement of Women and Sport and Physical Activity (CAAWS) is a national non-profit organization dedicated to creating an equitable sport and physical activity system in which girls and women are actively engaged as participants and leaders. CAAWS provides a number of services, programs and resources to a variety of clients, including sport and physical activity organizations, teachers, coaches, health professionals and recreation leaders. Since 1981 CAAWS has worked in close co-operation with government and non-government organizations on activities and initiatives that advocate for positive change for girls and women in sport and physical activity communities. Visit www.caaws.ca for more information. Congratulations to Christopher Perkins who ended his 2011 outdoor season on a high note: shooting 1401 on the FITA1440 round at the provincial championships in London, ON on September 10, 2011. A tremendous accomplishment, Christopher is among a very small group of archers who have passed this milestone! Congratulations to Christopher Perkins who won the national championship and the Open. Michael Bracey shot his personal best on both rounds, Jordan Sequillion won a personal-best number of elimination matches, Nancy, Georcy and Molly all went deep into the elimination rounds, Logan shot his average for the year, and Patrick and Eric Peters shot well for their first national championships. Michael Bracey, Nancy Chalut, Logan Coulter, Christopher Perkins, Eric Peters, Patrick Peters, Jordan Sequillion, Molly Solc and Georcy-Stephanie Thiffeault-Picard. Congratulations to Peter Garrett who won the World Archery 3D championship in his equipment division in Austria over the Labour Day long weekend. Christopher Perkins, 2011 World Senior Champion. Congratulations! Christopher Perkins – Taking it in. Congratulations to Christopher Perkins as a member of the gold-medal junior men’s compound team in Legnica! Congratulations to Molly won performed to her average this year at this event – a true accomplishment for any archer! Unfortunately, Georcy became ill during the ranking round – these things happen. Congrats go out also to Christopher and his mixed team partner Katie Roth – great job! Now it’s on to the Provincial Champs to end the season. 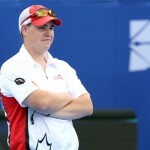 After a terrible start to his trip, thanks to Air Canada, Christopher Perkins finally has been able to join Molly Solc and Georcy Thiffeault-Picard at the World Archery Youth Championships in Legnica, POL. Good luck to all members of the Canadian team. GO CANADA, GO! Thanks to our webmaster, Shane Bryson, we’ve got a new-look area for photos. Look for the 2011 banquet photos under Archery Info. South Nation Archery Club is ecstatic beyond words to announce that today in Torino, ITA Christopher Perkins won the senior men’s compound individual championship. We are honoured to be part of the support network for Christopher over the past 6 years. 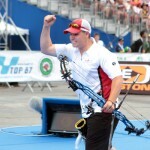 Earlier today, Christopher was a member of the men’s compound team that won the bronze medal. Congratulations, Christopher on a tremendous achievement and great shooting! Christopher’s next major events are the Canadian nationals in Delisle, SK and then the youth world championships in Legnica, POL in August.